The type of influence sabino has on a pattern varies a lot from individual to individual. Sometimes the only clue will be the white on the face, or perhaps a slightly more complex distribution of dark patches. In other cases, there can be enough breaking apart and roaning of the original pattern that it can be hard to see that tobiano is present. Still other horses simply have the white that was there from other patterns amplified. This horse is a good example of that effect. The frame pattern put the white on her neck and side, and she is probably carrying one copy of the splash gene. Sabino has taken those two patterns and “amped up” the white. That is particularly noticeable with the splash pattern. 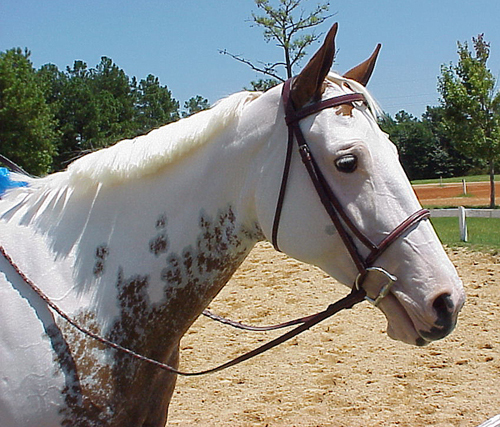 This type of face marking, with the head entirely white and the eyes both blue, is often thought of as being caused by splash. In fact it isn’t actually a characteristic of heterozygous splash in its pure form. In breeds without the sabino patterning genes, horses with just one copy of the splash gene do not typically have a lot of white on the face. In fact, they often don’t even have blue eyes. To get that kind of face in those breeds, you need two copies of splash. Yet in breeds where sabino is present, this kind of presentation of splash is pretty common. Sabino is boosting the white, although where the white is going is being directed by the tendencies of the other patterns. Returning to the tovero horse that illustrated the initial blog post on pattern interactions, we can see that these different kinds of sabino effects can appear on one horse – or even differently on different parts of the horse. The dark areas on his face and neck have a scalloped quality to them, as if the edges were made by numerous ovals layered over one another. In contrast, the hindquarters have a smaller-scale, lacey edge. Even within this area, parts of the pattern have pronounced haloing, while other areas are not mapped at all. Looking at these two pictures side-by-side, it’s hard to imagine they come from the same horse. And yet they not only appear on the same side of one horse, we attribute them to the same pattern – sabino. One of the things that contributes to this broad range of expression in that what we think of a one pattern – sabino – is actually a group of genes. In genetics-speak, it is “polygenic”. 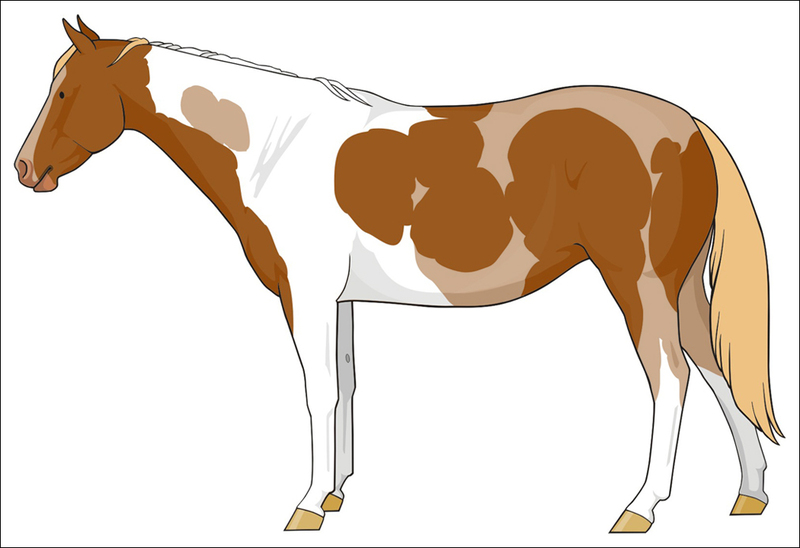 Sabinos vary more than any other pinto because the term is actually a catch-all for what is actually many pattern genes. Researchers have not yet found the key to this particular puzzle. 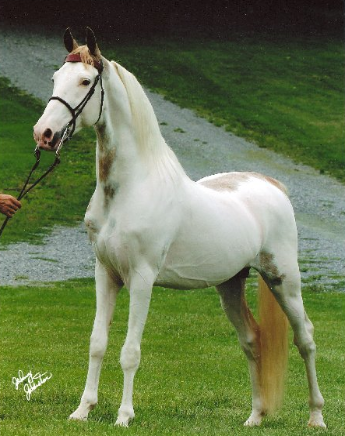 At the moment there is one identified gene (Sabino1) and one group of genes (Dominant White) that result in horses that look sabino; they result in strikingly similar horses, as a matter of fact. Yet they are two separate genes with very different modes of inheritance. What’s more, very few visually sabino horses test as having either of those genes. It is likely then that there are many genes involved, most of which we cannot yet identify. This is why sabino-influenced patterns can look so different from one another, and why determining which pattern or patterns a horse has can be difficult. The post from yesterday talked about the tendency of sabino to break dark areas of a pattern into smaller, more numerous pieces. The other thing that sabino tends to do is degrade the edges of the other pattern by making them lacey, roany or ragged. Using the pattern from yesterday, here is an example of how that might look. 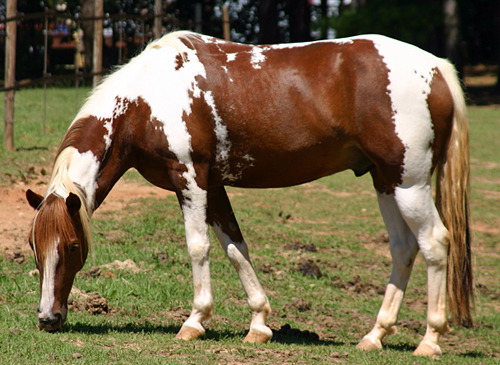 The tobiano pattern is still plainly visible, but the edges have become lacy and irregular. Looking carefully, it’s obvious that this isn’t an overlay of a loud sabino pattern because the irregular areas are concentrated along the edge of what would be a tobiano pattern, instead of the areas associated with sabino. Here is a horse with this type of sabino influence. 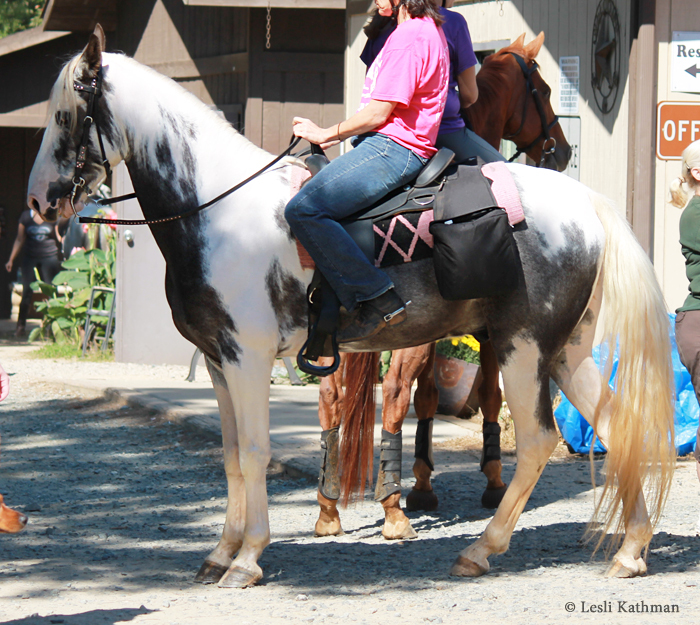 Notice that while he does have lacey markings along the girth – something you could expect on a sabino – the primary direction is upward toward the withers, following the line his tobiano pattern might take. Meanwhile, there is almost no white under that front armpit or along the belly, which would be the most likely place to look for white on a purely sabino horse. 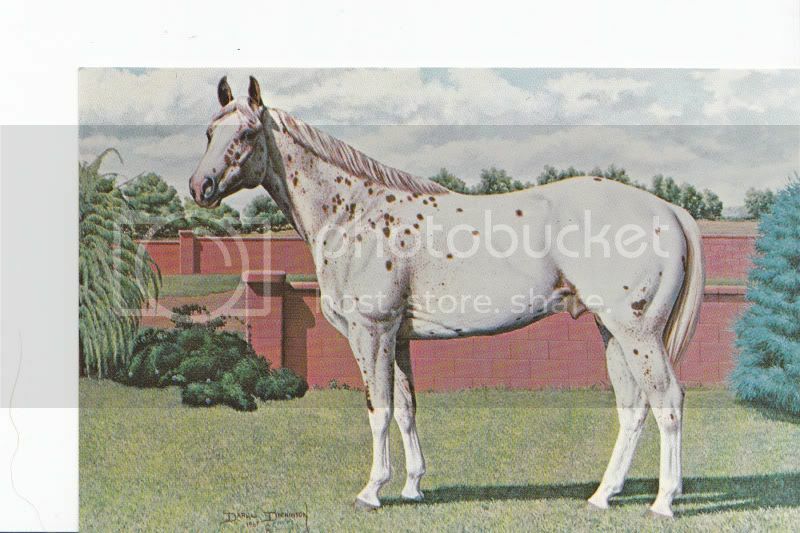 So the sabino instruction to “add lacey white” has been redirected to follow the pattern edges laid out by the tobiano gene. And here is a more extreme version of lacing the edges. The edges aren’t always lacy, though. Sometimes the edges take on more of a ragged, torn appearance. This horse is a good example of that. 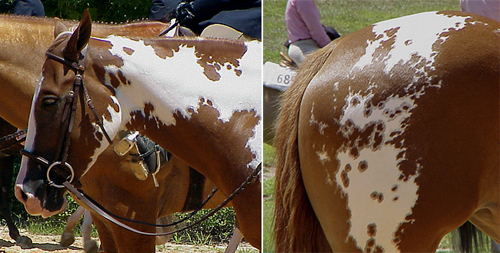 Laced edges are something not only seen when sabino is paired with tobiano, but other patterns as well. This horse is most likely carrying sabino and frame. 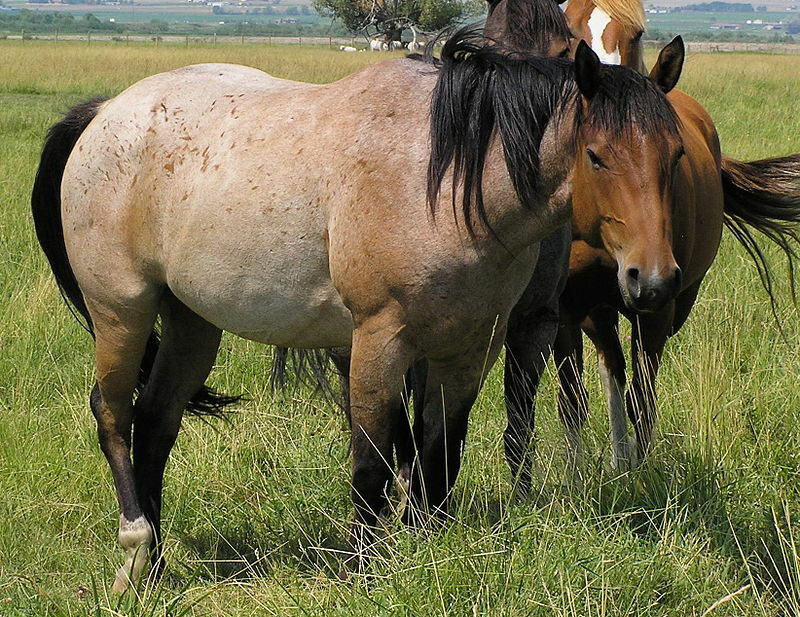 The softened, roany look to the marking on her side is very typical of sabino, yet all four legs are unmarked. Although not as obvious in this picture, the marking did not extend under the belly either. The appearance is that of a purely frame pattern with just the outline altered. 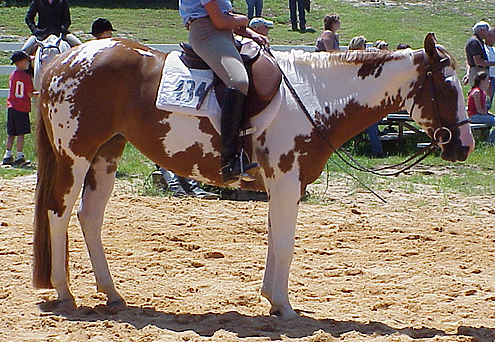 And here is a splash overo with laced edges. Notice how the sabino patterning follows the edge here, too. I should caveat this post with one warning for painters, though. It is true that complex, ragged edges are associated with the presence of sabino and that horses without it have simpler patterns. The edges are more even, but it should be said that even on simple tobianos – and simple splash overos, the other “smooth” edged pattern – that the edges can still have irregularities. 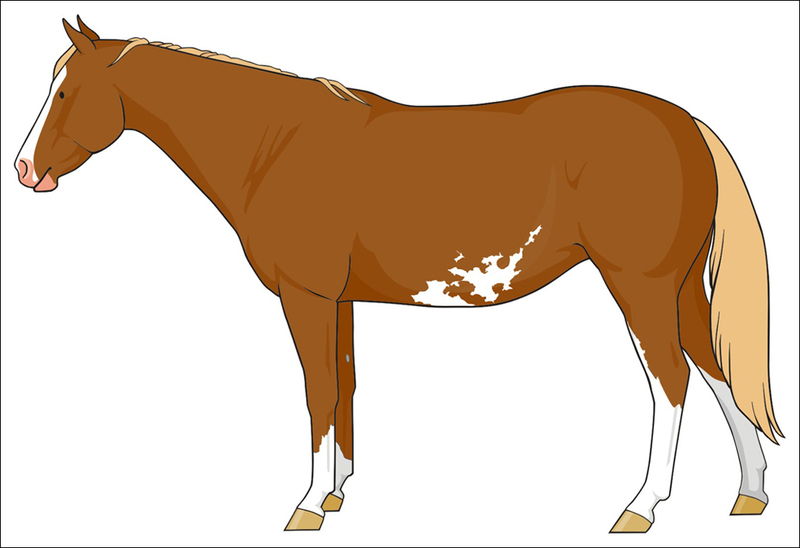 Here is a close-up of the brown tobiano mare from the previous post. 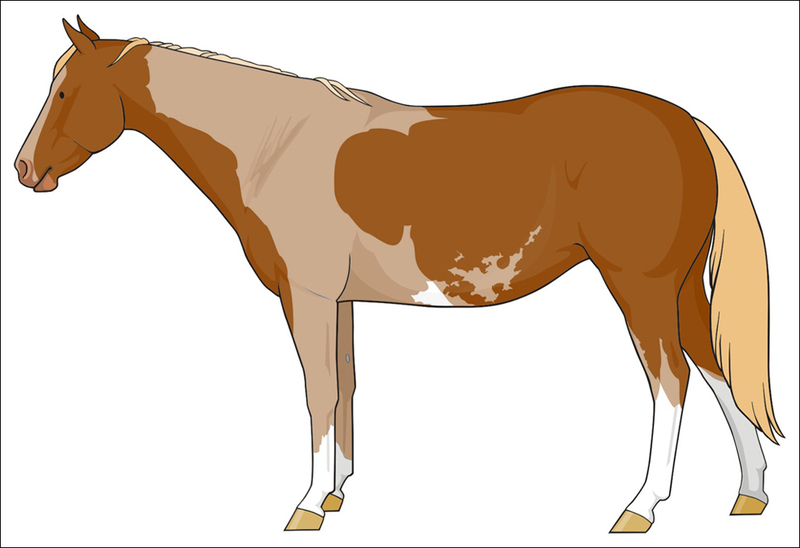 In the last post, we had a horse with both the tobiano pattern and a sabino pattern, and looked at what the horse might look like if patterns simply overlaid one another. That’s not, of course, how things work. Here is one version of how those two patterns might interact. Here the sabino pattern has added white to the face, but has also broken the original tobiano pattern into smaller pieces. The pattern still retains a great deal of tobiano character with the rounded spots, but there are more of them and they are smaller. This type of interaction is visible on these horses. With each of these, sabino has taken the areas of the tobiano pattern that should be dark, and made them both smaller and more numerous. Sabino often influences other patterns in this way. Compare the patterns on those horses to the more simple pattern on these. Reducing size and increasing frequency of spotting is a consistent feature of sabino influence. 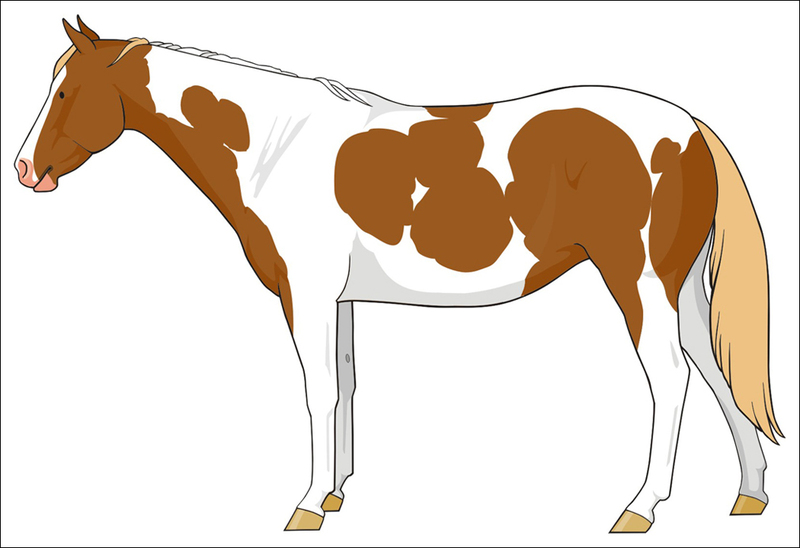 To get a better sense of this, assemble a set of tobiano Paint Horse references, and group them into two piles – horses with face white, and horses with nothing more than a star or snip. Comparing the two groups, the patterns with the sabino influence should appear more complex, with the dark areas more broken up than those without it. 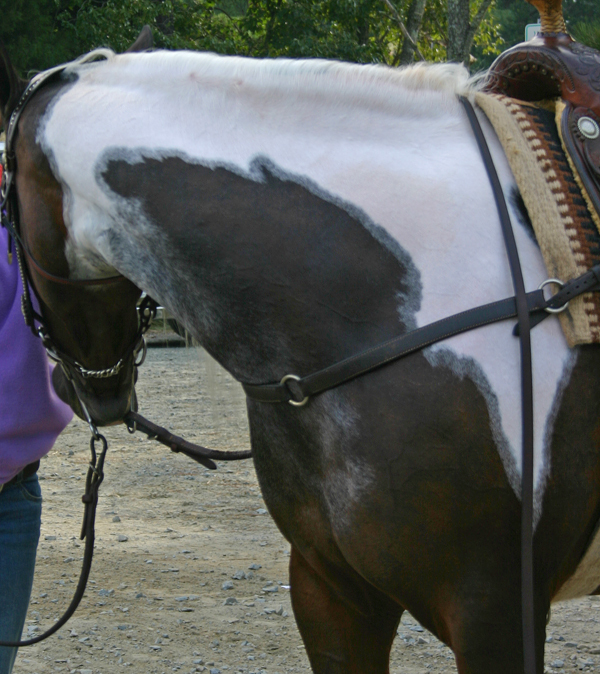 Obviously there are other patterns that put white on the face, but for that breed the numbers are in your favor that most face-marked horses carry some form of sabino. Sabino does this with other patterns, too. 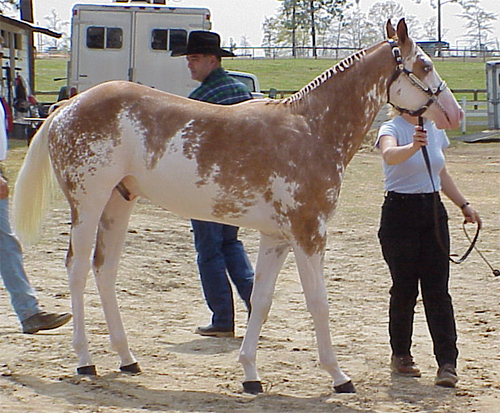 Appaloosas with sabino markings – that is, those with blazes and white feet – often have smaller spots broken up with larger areas of white than appaloosas with solid faces and no white on the legs. 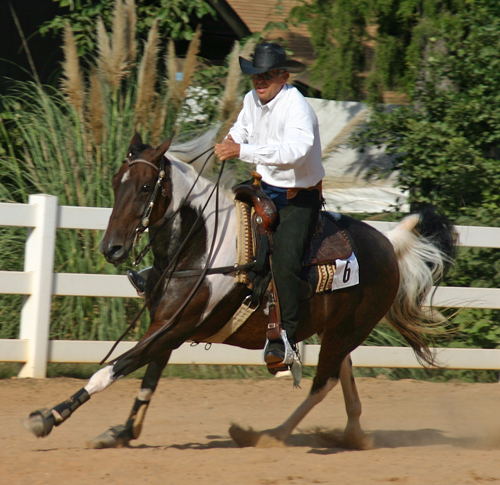 The type of pattern many associate with the Appaloosa stallion Prince Plaudit is a good example of this kind of interaction. That is actually what made me think that the earlier Pato horse might be a manchado despite the fact that the spots across his hindquarter were not as large, nor as rounded, as the ones I had seen on more obvious manchados. That kind of change is something I might expect to see when a pattern is combined with sabino. In the next post I’ll cover the other way that patterns are often changed when they are paired with sabino, which is laced edges. 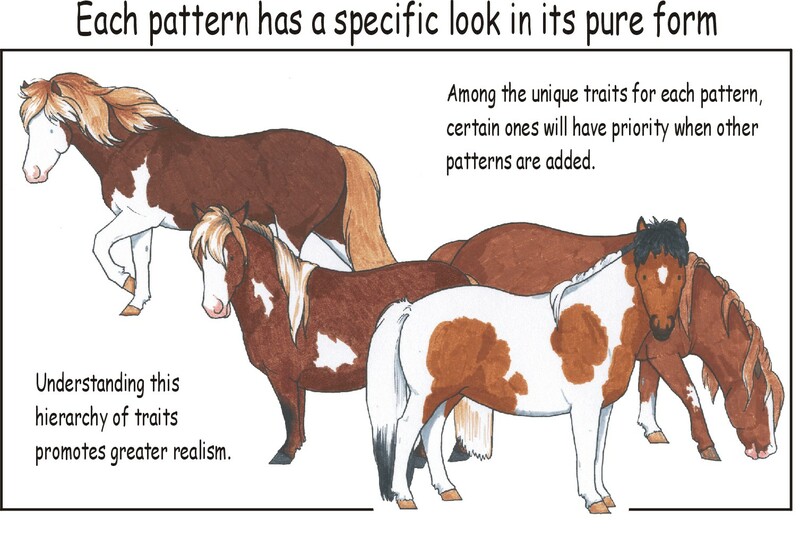 A few years ago, when giving a presentation on horse color, I used the term “pattern hierarchy” to describe what happened when a horse inherited two or more patterns. Often the genetic instructions from one pattern conflict with those of a second pattern. 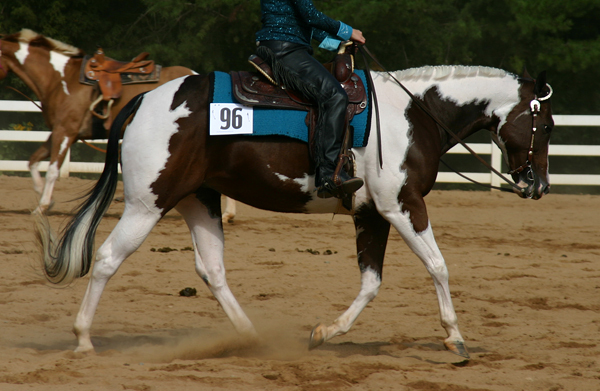 For instance, the gene for the frame pattern dictates that the horse should have dark legs, while tobiano calls for white on all four legs. In that situation, would the legs be white, dark or some combination of both? Pattern hierarchy seemed to be a good term for the rules that governed which instructions took precedence. In presenting things this way, I was trying to dispel the idea that white patterns are simply layered one on top of another. It is easy enough for an artist, especially an artist painting a three-dimensional figurine, to approach white patterns in this way. 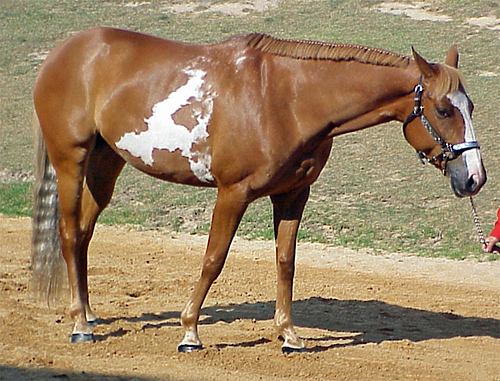 It is often how patterns are painted, with white added over the top of the body color. I felt it was important that artists understand that while patterns can layer in this way, their relationships were not strictly additive. Sometimes the genetic instructions not to add white in a given area had priority. 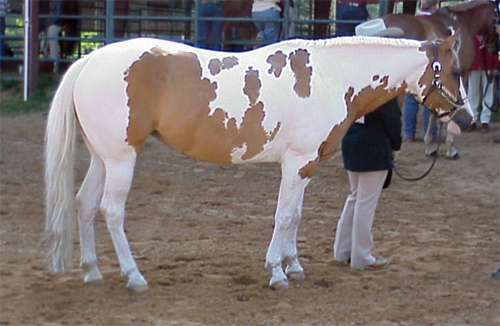 An extreme, mostly-white sabino that inherited the frame gene might have a dark topline, because the prohibition against white on the topline was stronger. But my own observations tell me, and recent genetic studies certainly confirm, that the situation is a bit more complex. What I called pattern hierarchy might more accurately be called pattern interaction. It is true that sometimes that interaction boils down to a simple hierarchy; the white leg rule for tobianos pretty much overrules any instructions about leg color from the other patterns. But sometimes one set does not take precedence, and instead the instructions for one pattern are subtly altered by another. 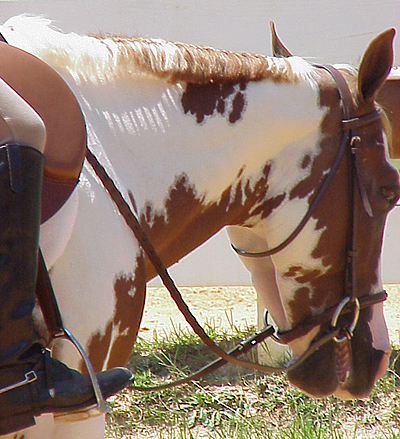 Of the various pattern combinations, tobiano paired with sabino is probably among the most common. In fact, among American horses it can be pretty difficult to find tobianos who are not also carrying some form of sabino. Most light breeds, and almost all New World breeds, carry sabino to some degree. That makes it a good place to study the interaction of the two patterns because there are so many examples. This is what tobiano typically looks like when no other patterns (or modifying factors) are present. The face and chest are dark, as are the hindquarters. The edges are smooth, and while they do not form perfect circles, they do suggest large, rounded shapes. Notice also that there is no visible face white. 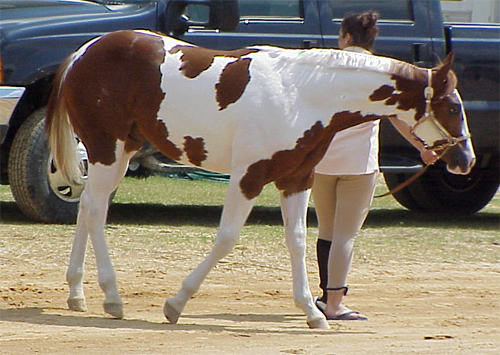 In most breeds tobiano does not add white to the face, so without one of the patterns that does, the face will be solid or nearly so. This is what sabino (or at least one of the more common forms of it!) typically looks like when no other patterns are present. Unlike tobiano, which has a pretty consistent look in its pure form, sabino has a wide range of expression. Nonetheless, the blaze extending over the lips and chin, white on the belly, stockings that rise in the front of the leg and ragged edges are all typical for sabino. Here is a tinted overlay of the two patterns. 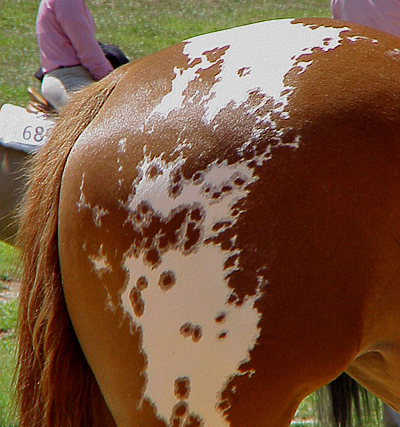 Which, painted one on the top of the other, would result in a horse that looked like this. 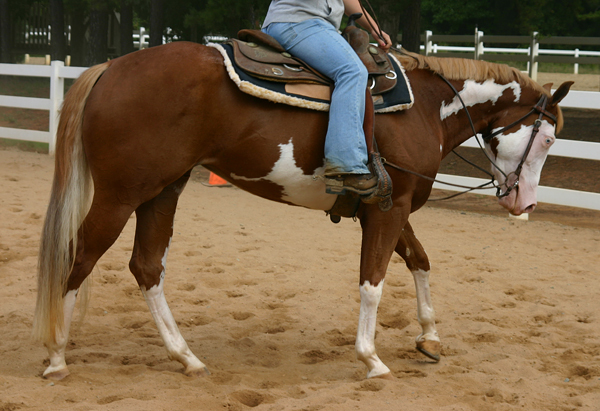 Notice the conflicting instructions for the white on the closest hind leg. The tobiano pattern has white travelling up the broad side of the upper leg, as is more typical for that pattern. Sabino, meanwhile, has the white moving up the front edge of the leg. If patterns behaved as simple overlays, this is how a combination of these two patterns should look. And if patterns had a simple hierarchical relationship – if accurately portraying combinations was just about resolving conflicting instructions – all we would need to know is which version of that leg white might “win out”. Does the white go to the front, or to the side? The problem with this approach is that it assumes the two patterns remain discreet, separate from one another. 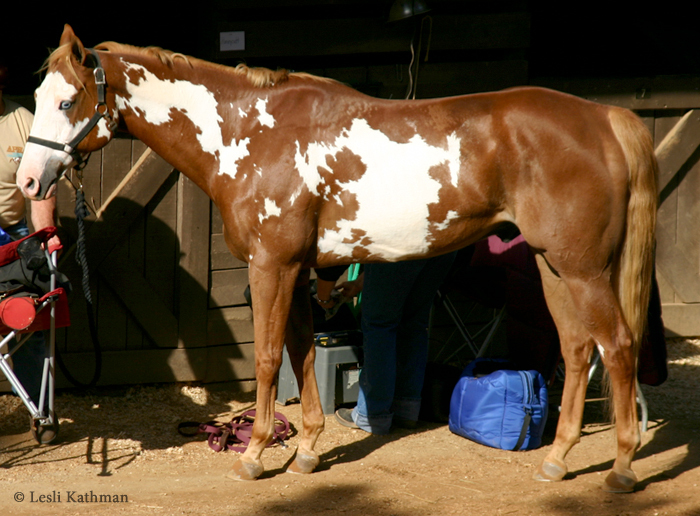 What actually happens is that sabino will subtly alter the original tobiano pattern. Tobiano is still going to predominate, of course. 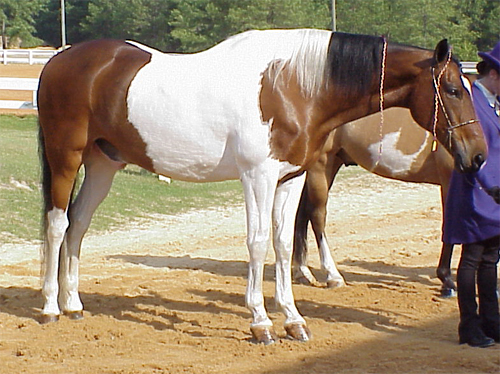 In the simpler, hierarchical view of pattern combinations, tobiano can be considered “king”. 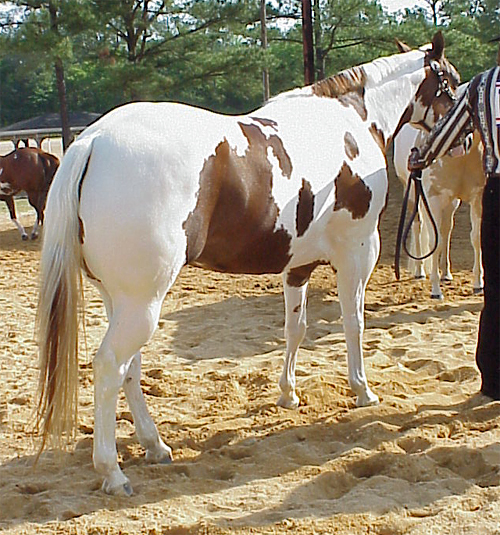 Whatever else is inherited, horses with the tobiano gene almost always retain a strong suggestion of the pattern. But the effect of the sabino gene will be visible. In the next few posts, I’ll talk about the different ways that sabino tends to interact with other patterns. This ties in with what was going on with the possible manchado discussed a few days ago, because the first interaction we’ll cover is the tendency of sabino to alter spot frequency.